You can find the PTCL number with any of the following services. 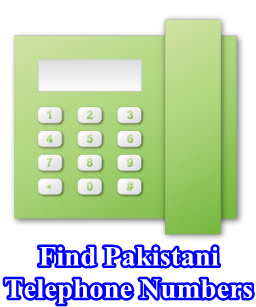 How to Search PTCL Telephone Numbers of Pakistan? Here we will reveal this secret of finding telephone number and address of any person of Pakistan. Here are some useful tips to find telephone number of any person in Pakistan. Enter the full name and address of the person, whom you are finding. If you don't know the exact address, you may only enter the city name. If you even don't know the city then only enter the name of the person and click SEARCH. You may also find the telephone number by entering only the partial name. But in this way the result will be very long and you have to do some manual search after searching of this website. It means that you can put only Uzma insteas of Uzma Khan. I am searching for a proper method of searching Mobile Numbers of Pakistanis. But still I could not found any. As soon as I found I will share with you. If you know any method you can share by entering it into comments box. It was [ I repeat , it was ] a very good effort. But , unfortunately , it has never been updated . Once obsolete , document does not fulfill its intended use. May I point out , the city list does not include Sheikhupura , a satellite industrial city with Lahore. Will any body respond ? 0544415152 ye nomber kahan ka he.or ye kis jaga se ho raha he.kisi banday kw tang kar ta he. Another purpose behind getting your own one of a kind telephone framework is to stay in the focused zone. how expensive is a 0800 line?